Detailed review of Asterwood Naturals Vitamin C Serum. See what real experts and actual users have to say about this face serum. 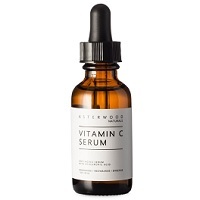 Asterwood Naturals Vitamin C Serum is the second face serum I’ve tried from Asterwood Naturals. Since I had given the other serum a pretty good rating, I had high hopes for the Vitamin C serum. Unfortunately, this face serum didn’t perform as the other serum did. Marketed as an anti-aging serum, Asterwoood Naturals Vitamin C Serum promises to deliver on everything from preventing the breakdown of collagen and enhancing skin elasticity, to giving you a more radiant complexion and decreasing fine lines and wrinkles. None of this resulted from using the face serum, which was a major bummer. Apart from the lack of results, this thin, watery face serum is more difficult to apply and incorporate into your skincare routine and will leave you with dry patches and an uncomfortable chapped feeling on your face. Despite the great price tag, Asterwood Naturals Vitamin C Serum is one you can skip when looking for an anti-aging face serum. Asterwood Naturals Vitamin C Serum has a texture identical to water. It truly feels like you are rubbing water on your face and neck. Once it absorbs, it doesn’t leave behind any residue at all. It completely dries down and doesn’t feel like you’ve applied anything on your skin. Part of me enjoyed that because it didn’t impact how my other products applied, but another part of me really disliked it. I like to feel like I have something on my skin doing work, and this doesn’t feel like I’ve even applied a face serum at all. The application of Asterwood Naturals Vitamin C Serum is relatively simple. Once you’ve cleansed and toned your face, and allowed your skin to fully dry, apply half a syringe worth of product into the palm of your hands, rub your hands together, and rub them on your face and neck. Once the serum has dried, apply your moisturizer and any other face products you use daily. It doesn’t directly say to use it twice daily, but I just assumed and used it both morning and night. Since there isn’t any residue left behind at all, it was super easy to layer my other face products on top of it, and I could easily use it under my makeup. One thing it does instruct is that you can use the serum with or without a moisturizer. This is absolutely not moisturizing at all, so I would strongly recommend against skipping your moisturizer. In general, I really struggle with applying watery serums because it feels difficult to apply it evenly to my face and neck, and I hate that I can’t use my fingertips since the product will slip through the cracks in my fingers. Using my palms just feels awkward, so that makes the application of Asterwood Naturals Vitamin C Serum slightly more difficult. Since Asterwood Naturals Vitamin C Serum is so thin and watery, I expected it to have a long dry time, which is definitely the case. I would say it takes 45-60 seconds before your skin no longer feels wet. Since it really doesn’t leave behind any residue at all, I just based it on my skin feeling dry after application to determine the dry time. Asterwood Naturals Vitamin C Serum is completely odorless, which is a plus for anyone sensitive to strong scents in their skincare products. As I do with every new face serum I try, I used Asterwood Naturals Vitamin C Serum at night first. My first thought was how strange it was to use a serum that literally didn’t feel like I had applied a serum once it dried. I personally didn’t really like that aspect of it. The next morning, my skin looked exactly the same, but felt more dry than normal! It sort of had that tight, chapped feeling which can be (and was!) super uncomfortable. When it comes to anti-aging benefits, Asterwood Naturals Vitamin C Serum doesn’t deliver on a single one. I didn’t see a change in my fine lines, sun spots, skin radiance, firmness, elasticity, etc. I literally can’t identify a single anti-aging component that this face serum even changed in a minor way. Also, after about three days of using it, my skin was extremely dry and starting to peel. I knew when I first used it that it made my skin feel chapped and dry, but after a few days, I was experiencing peeling and skin flaking around my nose and mouth. Not cute at all! Overall, I really hated what this did to my skin and how it made it both look and feel. Definitely not a good experience! Any product that doesn’t deliver on the results it promises to deliver on, and leaves your skin worse off than it was before you used the product, is most definitely not worth the money. So even though Asterwood Naturals Vitamin C Serum is less than $14, it still is a complete rip off since it doesn’t work and leaves you with dry skin. Don’t allow the cheap price tag fool you into thinking this is a worth-while face serum—especially since you can’t return the product if you are unhappy with the results. Asterwood Naturals doesn’t have any information on their website regarding money back guarantees or returns, which I think is super weird. I’ve never seen a website with such little information, actually. So I think that’s a little weird. To purchase Asterwood Naturals Vitamin C Serum, click here.